The Dirty Bourbon River Show deftly melds sounds that range from hard-edged blues to Lisztian piano driven ballads to New Orleans brass into a result that is truly a blast of new energy into the musical landscape. Dirty Bourbon grabs hold of audiences, fascinated by their eccentricity and dexterity coupled with their ability to harken back to by-gone eras in music. Since forming in early 2009, the Dirty Bourbon River Show has released 10 studio albums and played over 1000 live shows, fast earning them a stellar reputation for their tight, multi-faceted sound and high-energy performances. They can be found bringing their blend of “New Orleans Big Brass Circus Rock” all over the world, performing at festivals and respected venues year-round. 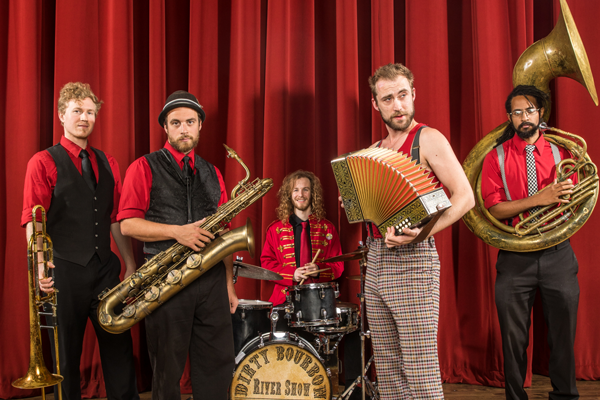 The Dirty Bourbon River Show is comprised of Noah Adams (vocals, piano, accordion, trumpet, trombone), Matt Thomas (vocals, tenor and baritone saxophone, clarinet), Nick Garrison (vocals, trombone, piano), Corey Bostic (sousaphone) and Scott Graves (vocals, drums, percussion).